Standard Kettle Tipper - A raised tilting platform, designed to assist with pouring from any standard kettle with virtually no effort or risk of spilling boiling water. When the handle is pushed gently forward, the platform pivots on its white coated wireframe, which has non-slip feet. It cannot drop forward accidentally or fall back past the horizontal. 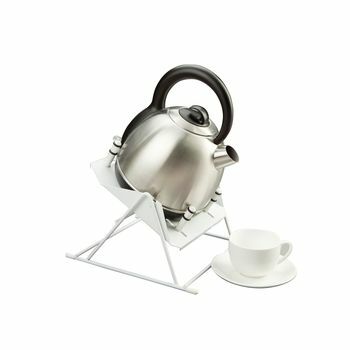 The frame is high enough to pour safely into a teapot, cup or mug. Not suitable for cordless kettles.